OVERVIEW: Featuring an all-star cast including Gerard Butler (300), three-time Emmy® nominee Michael C. Hall (Outstanding Lead Actor in a Drama Series, “Dexter,” 2008 & 2009; “Six Feet Under,” 2002), with Chris ‘Ludacris’ Bridges (Crash) and Golden Globe® winner Kyra Sedgwick (Best Performance by an Actress in a Television Series – Drama, “The Closer,” 2007), Gamer is a high-concept action thriller set in a near future when gaming and entertainment have evolved into an exhilarating yet terrifying new hybrid. 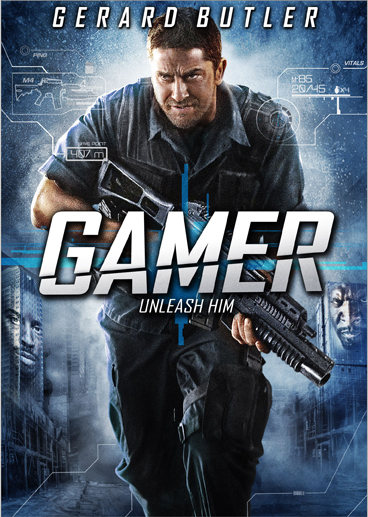 Available on Blu-ray Disc and DVD January 19, 2010, Gamer contains bonus materials that include audio commentary with the filmmakers and cast, a “making-of” documentary, plus a featurette looking at the groundbreaking camera work completed on the film. In addition, the Blu-ray Disc features I-Con Mode with expanded visual commentary, interactive scene-specific crew commentaries accessible throughout the film and a never-before seen theatrical trailer that was deemed too radical for audiences. The Blu-ray disc is also BD-Touch enabled™ and Metamenu Remote™ enabled as well as enhanced for D-Box™ Motion Control Systems. SYNOPSIS: In the future, humans control other humans in mass-scale, multi-player online games: people playing people...for keeps. Mind-control technology is widespread, and at the heart of the controversial games is its creator, reclusive billionaire Ken Castle (Hall). His latest brainchild, the first-person shooter game “Slayers,” allows millions to act out their most savage fantasies online in front of a global audience, using real prisoners as avatars with whom they fight to the death. Kable (Butler) is the superstar and cult hero of the ultraviolent “Slayers.” Taken from his family, imprisoned and forced to fight against his will, the modern day gladiator must survive long enough to escape the game to free his family, regain his identity and to save mankind from Castle’s ruthless technology.